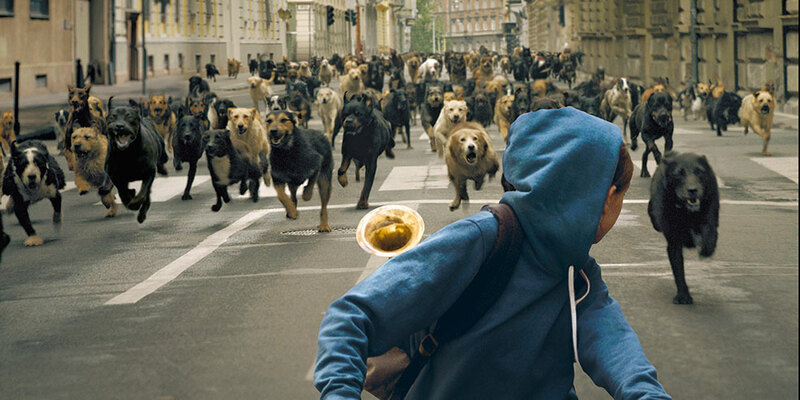 Kornél Mundruczó’s Cannes-winner, White God, has an interesting plot: After being ditched on the road, Hagen the Dog rallies together other street dogs to form a violent uprising against the humans who abused them and attempts to reunite with his owner, 13-year old Lili. There is a general artistry to be admired here (the opening scene is particularly great) and animal lovers will likely get both a kick and a catharsis out of the film. However, White God has several flaws that make it difficult to fully embrace. For example, Mundruczó flirts with magical realism by creating a world that’s not even that surprised when dogs plan tactics like Navy SEALs—but the dogs also can’t figure out when to stop barking to avoid being captured. This places the film in a weird genre, almost like a dark fantasy that aspires to feel real, except the foundation for reality is insufficient. The fact that the human characters are largely one dimensional lends to this insufficiency, although I wondered if this was purposefully done out of concern that the audience wouldn’t root for the dogs unless the humans were relatively…well, unrealistic. Perhaps the biggest issue to me is that White God leaves much to be desired from a cinephile-social-justice perspective. This is largely because it’s near-impossible to argue that the film is not intended as a metaphor for racism and class warfare. As a result, the decision to represent said impoverished and/or (by the title’s direct implication) people of color as swine and mutts becomes weirdly self-defeating, especially as the groups’ speech—something that is the most critical part of all social justice advocacy—is reduced to barks and whines. Intentionally or not, the film concludes with the sense of white ownership and superiority that prompted the events of the movie in the first place. It’s worth noting that Mundruczó himself is Hungarian; as a result, American cinephiles may view the racial themes in White God quite differently than he intended. For example, one scene involves police shooting into a pack of charging dogs, aiming to kill; here, police officers have fired on people of color who were walking peacefully down the street. It was impossible for me to watch this faux-realism without actual reality in mind. All this said, I’m reluctant to say that White God is a bad film—it’s just over-praised for cultural insight that it doesn’t fully possess or actualize. If anything, White God proves racism and classism exists everywhere in the world, but our perspectives on it are far from uniform. Watch it When: You’re looking for the gritty version of Homeward Bound. While You Watch: If viewing White God as a metaphor for race and class warfare, what is Lili’s trumpet?